Funny thing about voting -- sometimes the outcome is not what it should be. Take last night for instance. DANCING WITH THE STARS was down to three finalists and the first to go was Marie Osmond. Quite frankly, she shouldn't have lasted that long, but her exit made way for a decent outcome either way. One could argue that Melanie Brown was the better dancer, but in our house, at least, Helio's victory was a cause for celebration. Of course, it didn't hurt for him to have one of the most beautiful and fantastic dancers imaginable as his partner. Kudos to both the bombastic Brazilian race car driver and the absolutely adorable Julianne Hough. Actually, DANCING WITH THE STARS had only one real stinker among the ten or so original candidates -- Mark Cuban. Fidel Castro would have been a more likeable choice, health issues notwithstanding. And, of course, there was poor super model Josie Maran whose gorgeous looks surprisingly masked any semblance of athletic ability -- her dancing partner even declared she was "deceptively unfit." You know, those words could be used to describe the contestants of another upcoming vote which I will call MEANDERING WITH THE MISCREANTS. I am referring, of course, to the 2008 Presidential Election and the current crop of front-runners. What a bunch of bozos. The current leader appears to be the only woman in the running, but I'll be damned if I want the first woman elected President of the United States to look like Don Zimmer was her father and Marge Shott was her mother. 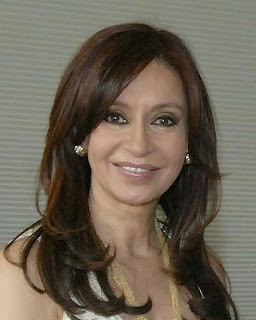 Why can't we find a female candidate that is smart and attractive -- Argentina sure did. Then there's that fellow named Mitt. What kind of name is that? Personally, I'm hoping Mitt goes the way of Marie. The same with Rudy Giuilani, John Edwards, John McCain, Barack Obama and Fred Thompson. No one is perfect, but these guys abuse the privilege.